Alianza owns a 100% interest in the White River property, consisting of 308 claims (approx. 6,400 hectares), acquired by staking. It is situated 11 kilometers north of Koidern, a minor settlement on the paved, all weather Alaska Highway. 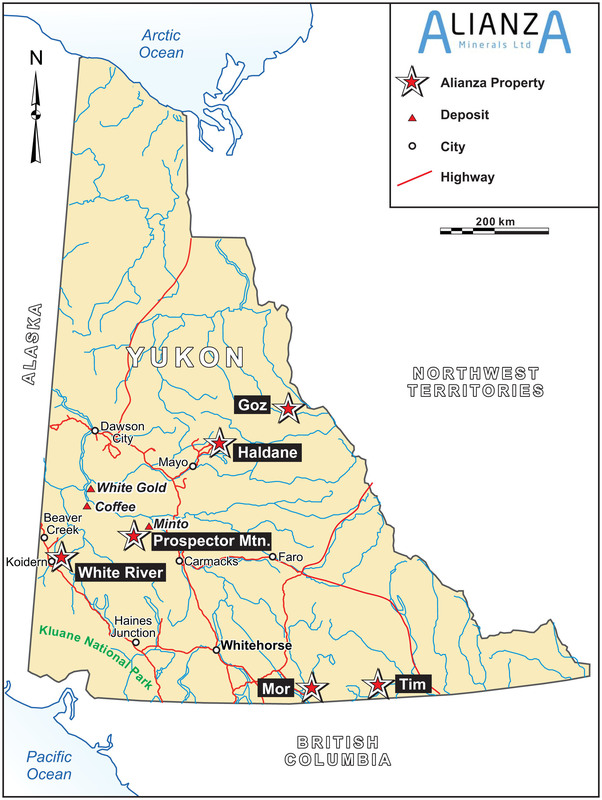 Koidern is located 390 road kilometers northwest of Whitehorse, the capital of Yukon. A 3,000 foot long grass airstrip is located 15 kilometers southwest of the property at the White River Lodge, which is adjacent to the Alaska Highway. The Alaska Highway can be seen from the property. Access to the property is by helicopter, the trip time is approximately 5 minutes. The property is located at the western end of the Nisling Range, within the Tintina Gold Province.